For this delicious chutney you can use the roasted skinless chana dal (pottukadalai in Tamil) or the whole ones sold as snacks in Indian (roasted chana) and middle-eastern (leblebi) stores. If neither of them is available, then you can toast regular chana dal in a little oil yourself. This is a great chutney to serve with Idli, Dosa, Upma, etc. Juice the lemon/lime; or if using tamarind, soak a small marble-sized lump of it in a couple of spoonfuls of warm water for about 10 minutes. Tamarind may have seeds/shells; when soft, check with your fingers and remove and discard any seeds or shells. Combine all the chutney ingredients with half the lemon/lime juice or the tamarind in the carafe of a blender and process into a thick smooth paste using about 1/2 cup water. Pour the chutney into a bowl and flush the carafe with a couple of spoonfuls of water and add to the bowl. Add a little more water if necessary to adjust the consistency of the chutney and correct the seasoning with more salt/lemon as needed. 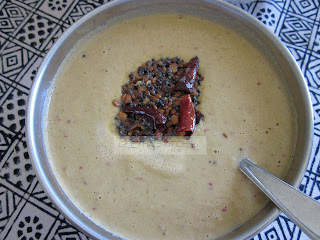 Prepare tadka/thalippu: Heat the oil in a small pan and add mustard seeds, chile, and the dals. When the mustard seeds start popping, stir in the asafoetida and then carefully add the curry leaves. Pour the whole thing into the chutney carefully (hot oil from the tadka might sizzle and spatter upon contact with the chutney) and mix well. If not serving right away, I like to add the tadka/thalippu just before serving since I like the occasional crunch of the dals; they get a bit soggy (but not inedible or bad in any way) otherwise.